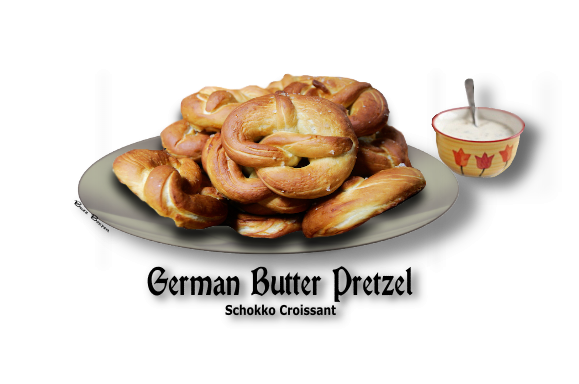 GERMAN BUTTER PRETZEL - "SCHOKKO CROISSANT"
These are soft pretzels with an Old World taste and filled with butter. Also called "Brezlen" these pretzels are an in-between-meals snack. Germans eat their pretzels with butter and forgo the mustard and cheese as in the U.S.A. German bakers also make a pretzel roll that is great with "Aufschnitt" (bologna) or the German favorite, "liverwurst". this pretzel recipe. Not recommended for baking with children. USE CAUTION WHEN WORKING WITH LYE - EXTREMELY CAUSTIC! sleeves, pants and close-toed shoes is recommended. or until butter is fully incorporated. At this time, the dough should be firm and soft, velvety to the touch. 5. Form into a ball, butter all surfaces and let rise until double, about 1 hour in a warm spot. anything burning on the skin, rewash with soap and water, rinse and dry. 7. Place wax paper on a baking sheet. dough slightly sticky. This helps with shaping. to make the ends stick to the loop. Pretzel bakers can flip pretzels into shape, but I have to coax them. splits the loop of dough into three equal parts. The picture shows amateur pretzels lacking these traits. into a bowl and add slowly to the water, stirring with a plastic spoon or similar object. ALWAYS ADD THE LYE TO THE WATER! NOT WATER TO THE LYE! The lye solution will be approximately 0.75 M NaOH (FW 39.99g/mol) or almost 3% w/w. slotted spoon and place on greased or parchment-paper-lined baking sheet. razor blade or lamé. Let pretzels rest for 15 minutes. 3. Heat oven to 375°F. Bake pretzels for 20-25 minutes, or until deep golden brown. metallic container, clearly labeled, to use again, although I don't recommend this. THIS OLD AND TESTED METHOD. FOR SOFT PRETZELS AND DOES NOT USE LYE AND IS THEREFORE NOT THE REAL GERMAN RECIPE. YOU ARE GOING TO GET WITHOUT USING THE LYE RECIPE.